Background and objectives Quality of life (QOL) is markedly impaired in patients with anemia, diabetes mellitus, and chronic kidney disease. Limited data exist regarding the effect of anemia treatment on patient perceptions. The objectives were to determine the longitudinal impact of anemia treatment on quality of life in patients with diabetes and chronic kidney disease and to determine the predictors of baseline and change in QOL. Design, setting, participants, & measurements In a large, double blind study, patients with type 2 diabetes mellitus, nondialysis chronic kidney disease (estimated GFR, 20 to 60 ml/min per 1.73 m2), and anemia (hemoglobin 10.4 g/dl) were randomized to darbepoetin alfa or placebo. QOL was measured with Functional Assessment of Cancer Therapy-Fatigue, Short Form-36, and EuroQol scores over 97 weeks. Results Patients randomized to darbepoetin alfa reported significant improvements compared with placebo patients in Functional Assessment of Cancer Therapy-Fatigue, and EuroQol scores visual analog scores, persisting through 97 weeks. No consistent differences in Short Form-36 were noted. Consistent predictors of worse change scores include lower activity level, older age, pulmonary disease, and duration of diabetes. Interim stroke had a substantial negative impact on fatigue and physical function. Conclusion Darbepoetin alfa confers a consistent, but small, improvement in fatigue and overall quality of life but not in other domains. These modest QOL benefits must be considered in the context of neutral overall effect and increased risk of stroke in a small proportion of patients. Patient's QOL and potential treatment risk should be considered in any treatment decision. Anemia is prevalent in patients with type 2 diabetes mellitus and chronic kidney disease (CKD) and is associated with increased mortality, significant symptom burden, and markedly impaired health-related quality of life (HRQOL) (1–6). Observational studies have suggested multiple aspects of HRQOL are impaired in these patients, including lack of energy, physical function, ability to work, sleep disturbances, sexual dysfunction, and cognition (7–9). The recent mandate by the Center for Medicare Services that all dialysis units monitor HRQOL emphasizes its importance (10). Although there is a perception that correcting anemia with erythropoiesis-stimulating agents (ESAs) improves HRQOL, most of these trials in nondialysis CKD patients were open label or compared two management strategies, potentially introducing bias. The Trial to Reduce cardiovascular Events with Aranesp(darbepoetin alfa) Therapy (TREAT) enrolled 4038 patients in 24 countries with diabetes mellitus, nondialysis CKD, and moderate anemia. The primary results of TREAT showed no difference in a composite of cardiovascular morbidity and mortality or in renal outcomes, with an excess risk of stroke, in patients randomized to darbepoetin alfa compared with placebo (11). 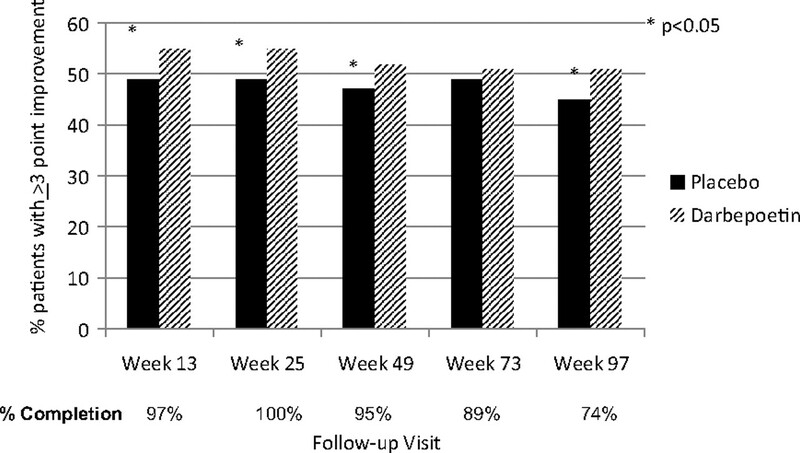 Darbepoetin alfa modestly improved fatigue at 25 weeks, which was the main HRQOL endpoint, and one of three instruments used to measure patient-reported outcomes. This study provides a more detailed and temporal analysis of darbepoetin alfa on HRQOL, with focus on three prespecified domains: fatigue, energy, and physical function. The three specific aims are (1) to assess the impact and durability over time of anemia treatment on HRQOL, (2) to identify the baseline predictors of changes in HRQOL, and (3) to determine the impact of interim nonfatal events, particularly stroke, on key HRQOL domains. The design, baseline characteristics, and primary results of TREAT have been published (11,12). Briefly, TREAT enrolled patients with type 2 diabetes mellitus, CKD not on dialysis with estimated GFR (eGFR) of 20 to 60 ml/min per 1.73 m2(using the four-variable Modification of Diet in Renal Disease Study equation), and anemia (baseline hemoglobin, 10.4 g/dl) without evidence of overt iron deficiency(transferrin saturation ≥ 15%). Double-blinded status was maintained using prefilled syringes of various strengths of darbepoetin alfa or placebo and using a third party individual not directly involved in the care of the study subjects who used a point-of-care hemoglobin monitoring device. The targeted hemoglobin level was 13 g/dl using a computer algorithm evaluating rate of rise and stability of hemoglobin levels. Rescue therapy with darbepoetin alfa was given to subjects randomized to placebo if their hemoglobin levels fell below 9 g/dl. Three distinct self-administered instruments were used. The Functional Assessment of Cancer Therapy-Fatigue (FACT-Fatigue) and EuroQol (EQ-5D) were collected at the beginning of TREAT. Short Form-36 (SF-36) was added after the second protocol amendment in May 2005, excluding the first 1049 subjects for paired analysis. FACT-Fatigue and EQ-5D tools were administered at baseline and weeks 13, 25, 49, 73, 97, 121, 145, 169, 193, and 217, and the SF-36 was administered at baseline and weeks 25, 49, and 97. FACT-Fatigue was prespecified as the main HRQOL endpoint, and the SF-36 energy/vitality and physical function domains were also prespecified as key outcomes. FACT-Fatigue contains 13 questions assessing symptoms during the past week, scored from 0 to 52, with higher scores representing less fatigue (13,14). Reliability and validity of FACT-Fatigue in oncology patients and a general population have been reported, and a clinically meaningful difference is 3 points (15). The EQ-5D visual analog scale is a valid vertical scale, scored from 0 to 100, with 0 representing the worst imaginable health state and 100 representing the best imaginable health (16,17); EQ-5D has been used extensively in many patient populations including CKD (18). The SF-36 is a reliable and valid measure of generic HRQOL (19,20) and is the most extensively used instrument in nondialysis CKD patients (21). There are eight domains, including physical function, role physical, bodily pain, general health, energy/vitality, role-emotional, social function, and mental health. The prespecified targeted SF-36 domains for TREAT were energy (4 questions) and physical functioning (10 questions). A 5-point change is generally considered clinically meaningful (22). For the purpose of simplicity, all three instruments will be referred to as measuring QOL. All patients in TREAT were eligible for the substudy. All SF-36 analyses used raw scores (0 to 100 range) and were repeated for norm-based score, as specified in the statistical analysis plan. Because the results were similar, presented SF-36 analysis used raw data (0 to 100 scoring) to facilitate comparison with other published trials/populations. Changes in all HRQOL measures were calculated longitudinally, limited through 97 weeks to minimize the effect of imputation. Only subjects with at least both baseline and week 25 measurements were included in the analysis. Missing items were handled using the standard, recommended imputation methods for the instruments. Last observation carried forward using last nonmissing postbaseline values were used for missing postbaseline HRQOL items for subjects who were still on study. The proportions of patients who had a clinically meaningful change in FACT-Fatigue and SF-36 energy and physical function scores were also calculated. Sensitivity analysis was performed without imputed data to ensure similar results. Mean change scores in FACT-Fatigue and SF-36 Physical Function and Energy subscales were calculated from baseline to each study visit occurring at weeks 13 (FACT-Fatigue only), 25, 49, and 97. Mean changes were compared across the two randomized treatment groups using a two-sided t test, and 95% confidence intervals were calculated for the mean difference between the two groups. A generalized linear model (analysis of covariance) was applied, adjusting for baseline scores and the stratification factors of proteinuria and cardiovascular disease history. The proportion of “responders” in the two groups (subjects experiencing 3-point improvement in FACT-Fatigue score or 5-point improvement in the two SF-36 subscales) was measured at each time period, and differences between treatment groups were assessed using the χ2 test. Multivariate models were developed to determine predictors of baseline HRQOL using the three prespecified domains (i.e., FACT-Fatigue, SF-36 energy, and SF-36 physical function). A mixed-effect repeated measure model was performed, adjusting for significant univariate predictors to identify independent predictors of improvements in the three prespecified HRQOL endpoints, using all baseline characteristics and key postrandomization factors (i.e., adjudicated clinical events, transfusions, and hemoglobin). All adjudicated clinical events for use in the multivariate models were censored at week 97. All analyses were performed by a statistical group at the sponsor and confirmed by an independent statistician at Brigham and Women's Hospital. The sponsor and independent statistician provided the writing group with unrestricted access to the data. This manuscript was written by the first author and subsequently revised by all authors. Of the 4038 patients enrolled in TREAT, 3531 (87.4%) completed the FACT-Fatigue and 3539 (87.6%) completed EQ-5D at baseline and 25 weeks. A total of 2295 of 2989 (76.8%) eligible subjects completed SF-36 at baseline and 25 weeks. The characteristics of those patients who completed HRQOL instruments at baseline were somewhat different than those who did not (Table 1). Instrument completion through 97 weeks was relatively complete. Baseline and follow-up FACT-Fatigue, SF-36, and EQ-5D scores are detailed in Table 2. In the unadjusted analysis at 25 weeks, fatigue was significantly improved in the patients randomized to darbepoetin alfa compared with placebo (FACT-Fatigue: mean change, 4.2 ± 10.5 versus 2.8 ± 10.3; P < 0.001). In contrast, there was no significant difference in the mean change in SF-36 energy domain (5.3 ± 20 versus 4.2 ± 19 for darbepoetin alfa versus placebo, P = 0.196) and physical function domain (3.2 ± 22 versus 2.6 ± 21 for darbepoetin alfa versus placebo, P = 0.514). All other SF-36 domains were also not significant at 25 weeks (Table 2). Overall HRQOL (measured by EQ-5D) improved more in the darbepoetin alfa group (5.6 ± 19) compared with the placebo group (4.0 ± 18; P = 0.011). The unadjusted mean change in FACT-Fatigue and EQ-5D remained significantly improved in patients randomized to darbepoetin alfa compared with placebo for each follow-up visit through 97 weeks. There were no significant differences in the unadjusted mean change scores of both Energy and Physical Function domains of SF-36 except for the 97-week visit. 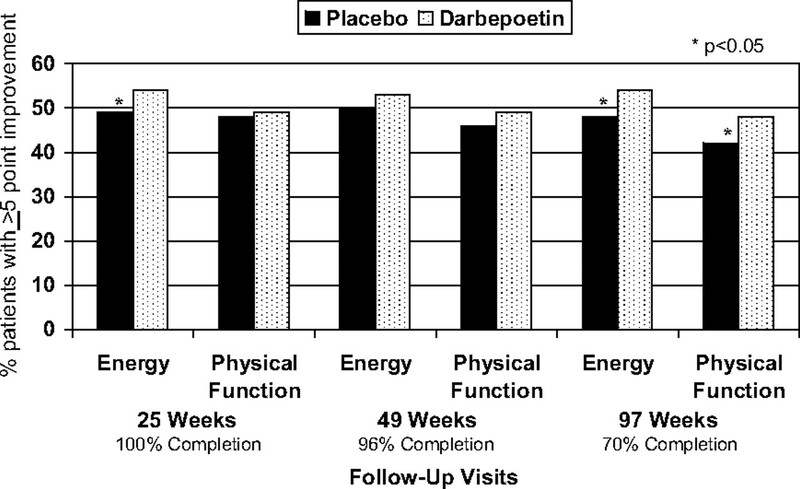 A ≥3-point increase in the FACT-Fatigue score (considered clinically meaningful) occurred in 963/1762 (55%) of the darbepoetin alfa and 875/1769 (49%) of the placebo patients (P = 0.002) at 25 weeks, and these differences in the proportions were consistent throughout most of the visits over 2 years (Figure 1). At 25 weeks, a ≥5-point increase in SF-36 Energy domain (considered clinically meaningful) occurred in 611/1138 (54%) of the darbepoetin alfa and 569/1157 (49%) of the placebo patients (P = 0.027). A ≥5-point increase in SF-36 Physical Function domain occurred in 557/1138 (49%) of the darbepoetin alfa and 546/1157 (48%) of the placebo patients (P = 0.482). These findings were consistent throughout 2 years (Figure 2). Clinically meaningful improvement in FACT-Fatigue scores defined as proportion of patients at each time point with ≥3 point improvement. A higher score is associated with less fatigue. Clinically meaningful improvement in SF-36 Energy and SF-36 Physical Function Scores defined as proportion of patients at each time point with ≥5 point improvement. A higher score is suggestive of better QOL. Several factors were consistent predictors of all three key domains of HRQOL at baseline (Table 3). The most powerful predictors of better HRQOL at baseline include higher physical activity, self-described black race, male gender, and higher albumin. Patients who worked, had a higher baseline hemoglobin, and who were older had better perceptions. Lower HRQOL was noted among those with pre-existing cardiovascular or pulmonary disease, higher body mass index, and diabetic neuropathy. Using linear repeated-measures models incorporating all visits through 97 weeks, several baseline and interim predictors of long-term changes in HRQOL were identified (Tables 4⇓–6). Consistent predictors of decrements in all three domains include older age, higher baseline HRQOL score, lower activity level, pulmonary disease, and duration of diabetes. Lower body mass index and lower triglycerides were associated with significant improvements in physical function and fatigue. Self-described blacks were more likely to note improvements in fatigue and energy, and men noted improvements in physical function and a trend in improved energy. Other significant factors were not consistent predictors across the three domains. Postrandomization events had a significant impact on HRQOL. Hospitalization events and hemoglobin <9 g/dl at any point were significantly associated with worse scores on all three HRQOL domains. The occurrence of stroke had a substantial negative impact on fatigue (−5.0 ± 1.3 SE) and on physical function (−10.5 ± 3.5 SE). Although there were trends in worse patient reported outcomes after acute heart failure event or the development of ESRD, these were not statistically significant. After adjusting for all other predictors, randomization to darbepoetin alfa improved FACT-Fatigue scores but did not influence SF-36 energy or physical function scores. Change in hemoglobin throughout the 97 weeks was highly collinear with randomization arms, and inclusion of this variable in the model negated the independent predictive ability of randomization to darbepoetin alfa. Several sensitivity analyses were performed. Only nonimputed data were used (excluding last value carried forward), which did not change the results of the univariate analysis for impact of therapy. There was no consistent impact on the magnitude of change scores during follow-up when patients were stratified by either baseline hemoglobin or eGFR. The principal new finding in TREAT is that, in comparison to placebo, patients randomized to darbepoetin alfa noted a significant improvement in fatigue, of modest clinical significance, by 13 weeks, and this difference persisted through 2 years, even after adjusting for other independent predictors of improvement. Despite the concomitant improvement in overall HRQOL as measured by EQ-5D, there were no consistent differences in energy or physical function scores using the SF-36. The baseline HRQOL of TREAT patients was as impaired as those with advanced heart failure (23), cancer (24), myocardial infarction (25), and on dialysis (26). Therefore, improving patient's sense of well being was an important secondary outcome evaluated in TREAT in particular and for CKD in general (10). Few studies evaluate long-term effects of treatment on HRQOL. Given the prevalence of anemia in patients with CKD and diabetes, estimated at 40 to 50% of patients (4,27), understanding the long-term HRQOL outcomes of anemia treatment needed elucidation. Prior studies of ESAs in nondialysis patients showed considerable between-study heterogeneity in terms of patient characteristics, starting hemoglobin concentrations, target hemoglobin concentrations, durations of follow-up, choice of HRQOL instrument, and research design (21). However, the collective experience in placebo-controlled studies of this population is low. The U.S. Recombinant Human Erythropoietin Predialysis Study Group followed 117 patients for 8 weeks, showing improved energy and work capacity with anemia correction using a 5-point Likert scale (28). Kleinman et al. (29) reported HRQOL improvement among treated patients and no improvement among placebo patients followed for 12 weeks (n = 14). Most remaining studies evaluating patient-reported outcomes did not use a placebo-controlled design. The effect size of HRQOL changes generally was greatest in open label single-arm studies with generally diminishing effect size in open-label randomized studies and double-blinded comparative studies of two active therapies (21). Using the SF-36 Energy/Vitality subscore as an outcome, single-arm studies resulted in improvements in scores of >14 (7,30) compared with net differences of 8.9 points with Revicki et al. (31) comparing open-labeled treated and untreated patients. The Cardiovascular Risk Reduction by Early Anemia Treatment With Epoetin β study showed a moderate effect of early correction of moderate anemia compared with later treatment (32), and the Correction of Hemoglobin and Outcomes in Renal Insufficiency study showed a clinically significant improvement in patient-reported energy and physical function scores in both high and low hemoglobin target groups, but no incremental between-group differences. Parfrey et al. (33) (n = 596) showed a clinically significant improvement in some HRQOL domains, with full correction of anemia in hemodialysis patients who had moderate anemia at baseline in a double-blinded study of two strategies. Given similar impairments of baseline HRQOL between TREAT patients and other kidney populations, the modest effects in TREAT likely represent the true impact of therapy and show the importance of calculating magnitude of HRQOL benefit with placebo-controlled studies. In determining the clinical meaning of HRQOL outcomes, confounding factors influencing these outcomes must be considered. Knowledge of the intervention or hemoglobin achieved may influence patient perceptions about “benefit” (34). In a large cancer trial using erythropoietin, patient knowledge of hemoglobin achieved affected multiple HRQOL domains (35). Patients enrolled in open-label, single-arm studies may be influenced by meticulous follow-up and the general perception of efficacy. Baseline hemoglobin and absolute change in hemoglobin over time may influence patient perceptions with more attenuated improvements beyond 12 g/dl (36). Importantly, TREAT's study design reduced patient or investigator bias with regard to interpretation of patient reported outcomes, although we cannot quantitate the influence of routine injections on the perceptions of patients randomized to placebo. Prior CKD studies have evaluated predictors of baseline HRQOL (37,38). Contrary to dialysis patients (38), older patients had better physical function and less fatigue at baseline in our study, a finding supported in other chronic conditions such as heart failure (39). HRQOL was better among self-described black patients, and their perceptions improved over 2 years, which extends our understanding (40). Several additional predictors of better baseline HRQOL and improvements in HRQOL over 2 years included higher physical activity and lower body mass index. Physical activity has been associated with better outcomes in many chronic conditions, including heart failure and diabetes. Patients with higher hemoglobin noted better HRQOL at baseline, and severe anemia during follow-up was associated with deterioration of these perceptions. Severity of diabetes, as measured by neuropathy, retinopathy, and insulin use, negatively impacted physical function, supporting cross-sectional findings of a large diabetes population (41). These findings were variably supported in TREAT. Interim nonfatal events dramatically worsened HRQOL, suggesting the scales can be responsive; moreover, these nonfatal interim events may contribute to the variable HRQOL responses to ESA use with long-term follow-up. Despite a relatively infrequent occurrence, stroke conferred the biggest impact on change in fatigue and physical function scores in multivariate models. Although initiation of dialysis can dramatically influence a patient's sense of well being, this was not an independent predictor of HRQOL. Finally, adding the absolute change in hemoglobin to the model negates the influence of darbepoetin alfa randomization on fatigue, suggesting that the improved HRQOL conferred by darbepoetin alfa was through raising hemoglobin. Thus, knowledge of patient's baseline HRQOL and the presence of factors known to influence HRQOL longitudinally may be useful for patient counseling about aggressiveness of care and medical decision making. There are several limitations to this study. There is no disease-specific instrument developed specifically for this population. The widely used FACT-Fatigue (42) was designed for oncology patients, although it has been used in both CKD patients (43) and hemodialysis patients; preliminary qualitative research suggests that SF-36 domains of energy and physical function have reasonable content validity in this population (44). The number of domains evaluated could increase the likelihood of chance findings, albeit less likely given the a priori focus on three prespecified domains; however, providing complete HRQOL data enables comparison with other trials for future use. Finally, we did not measure depression or cognitive function, which are both impaired in patients with anemia and CKD (45). Nevertheless, this represents the largest study of placebo-controlled patients with diabetes and nondialysis CKD, which provides a robust assessment of this important feature of ESA treatment. The evidence from TREAT to support long-term improvement in HRQOL with treatment of moderate anemia with darbepoetin alfa in diabetic nephropathy is mixed. The improvement in some HRQOL domains (fatigue and overall HRQOL) was of modest clinical significance, and no consistent improvement was observed in energy or physical function. Several factors, some of which are modifiable, were predictive of longitudinal change in HRQOL. Given the neutral overall effect and increased risk of stroke with treatment, clinicians should individualize the use of ESAs in the management of patients with CKD and moderate anemia considering a variety of factors, including the patient's baseline HRQOL, severity of symptoms attributed to anemia, and the potential risk of treatment. The Trial to Reduce Events with Aranesp (TREAT) was funded by Amgen. The following relevant disclosures are for the authors of this manuscript. Dr. Lewis (grant support from Amgen and the Robert Wood Johnson Foundation); Dr. Pfeffer (consulting fees from Abbott, Amgen, AstraZeneca, Biogen, Boehringer Ingelheim, Boston Scientific, Bristol-Myers Squibb, Centocor, CVRx, Genentech, Cytokinetics, Daiichi Sankyo, Genzyme, Medtronic, Novartis, Roche, Sanofi-Aventis, Servier, and VIA Pharmaceutics and grant support from Amgen, Baxter, Celladon, Novartis, and Sanofi-Aventis, and being named coinventor on a patent for the use of inhibitors of the renin–angiotensin system in selected survivors of myocardial infarction); Dr. Feng and Dr. Gandra (employees of Amgen); Dr. Solomon (grant support from Amgen); Dr. McMurray (Consulting fees from Menarini, Bristol-Myers Squibb, Roche, Novocardia, Boehringer Ingelheim, Novartis, BioMérieux, and Boston Scientific, lecture fees from AstraZeneca, Solvay, Takeda, Novartis, BMS Sanofi, and Vox Media, and grant support from BMS, Novartis, Amgen, AstraZeneca, Cytokinetics, Hoffmann–La Roche, Pfizer, Scios, and GlaxoSmithKline); Dr. Toto (consultant and lecture fees from Amgen); Dr. Macdougall (consultant fees, research grants, and/or lecture fees from Amgen, Ortho biotech, Roche, Affymax, Takeda, Hospira, and Sandoz); Dr. Locatelli (member of an advisory board of Affimax, Amgen-Dompé, Jamsen Cilag, Merck, Roche, and of a safety committee for Sandoz); Dr. Parfrey (consulting and lecture fees from Amgen and lecture fees from Ortho Biotech); Dr. Moustafa has received research funding from Amgen; and Dr. Uno has no conflicts of interest. This manuscript is submitted on behalf of the TREAT investigators and publications committee. The primary results of the clinical trial were previously reported (ClinicalTrials.gov registration number NCT00093015). A small portion of the data was presented at the Canadian Society of Nephrology in May 2010 and the American Society of Nephrology in November 2010.